← June 2015 Legislative Update: Energy Procurement, Net Energy Metering, Electric Vehicle Chargers, and Green House Gas (GHG) regulation. The electric grid is designed to handle the highest demand expected in a given period, commonly referred to as peak demand. Depending on many factors, the time needed for peak demand and period of high demand approaching peak can be a small percentage of the hours in a year. California utilities generally hit their peak level of demand in the summer, when temperatures are hot and air conditioners are running. But for most of the rest of the year, demand is relatively low. This means that there is capacity in the grid that is not used much of the time. To measure how much of this peak capacity is used on average we use asset utilization rates – or the more wonky term, load factor. This is not a new concept but one that rarely comes up in energy policy conversations. We do hear about demand reduction, demand response, and load shifting. These important concepts are implemented through programs and tariffs offered by California utilities. They may also come up in relation to rate structures like time-of-use rates or the contribution of solar energy production or electric vehicles toward peak needs. These all are important topics in their own right but ultimately contribute to and affect overall grid asset utilization rates. To understand the role of asset utilization in the electric industry, it is important to distinguish between energy and demand. Demand is a measure of capacity (in megawatts, or MW) and refers to an instantaneous level of power. Energy is a rate that measures the amount of MW consumed over time (megawatt-hours, or MWh). A water analogy is helpful to illustrate the difference. Imagine a water pipe connected to your home or business. The diameter of the pipe is analogous to demand (MW) and the amount of water flowing through he pipe is analogous to energy (MWh). If you need a lot of water, you may need a larger pipe, so more water can flow through. Now expand this analogy to an entire utility service territory. The size of the pipe is analogous to the peak capacity (MW) of an electric grid. That capacity determines how much water (or energy in our case) can flow through the pipe. So, load factor is the ratio of average demand to peak demand. As a measure of asset utilization, a higher number is better. That means fewer assets are idle over time. Imagine a plane flying from San Diego to San Francisco 3 times a day. Now assume the plane has 200 seats (peak demand) and on average over the year it only fills 100 (average demand) of those seats on each flight. At the end of the year the plane was never more than half full on average. The load factor in this case would be 50%. In the electric industry load factor compares average demand to the peak demand as measured in megawatts (MW). 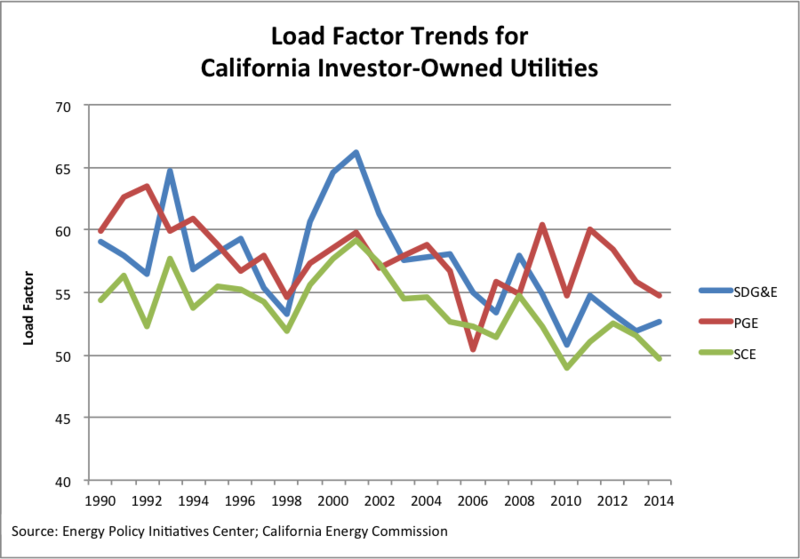 In California load factors for the three investor-owned utilities (IOU) are in the low 50% range. This means that average demand is half of the peak. Put another way, peak demand is twice average demand. So, much of the time we have grid capacity not being used, much like those empty seats in the plane example above. Ultimately, load factor is important because it affects customer rates. As mentioned above, the electric grid is designed to serve load reliably. That means the physical grid must be sized in a way that can accommodate the peak demand – the one moment of when demand on the grid reaches its highest point. In general, as demand grows, so grows the physical grid. And, because investor-owned utilities earn a regulated rate of return on their rate base, and because that rate base includes the physical assets of the utility, the size of the physical grid affects utility costs, which in turn affects rates. Load factor for California’s IOUs varies yearly but over the past 20 years the general trend has been declining – that is, peak demand is growing faster than average demand. Figure 1 plots load factors the three California IOUs. Generally, load factors declined through 1998 converging between 50-55. Shortly thereafter load factor increased in part due to the decrease in demand during the California Energy Crisis. SDG&E’s load factor spiked at this time with a load factor above 65, which likely is attributed to the fact that SDG&E service territory was the first to have divested itself of generation assets and to have market based rates under the industry restructuring rules at the time. Then a steady decline ensued as historic energy patterns resumed. Then lower demand due to the economic downturn seemed to have caused another uptick. The figure also shows that load factors differ fairly significantly among the IOUs. 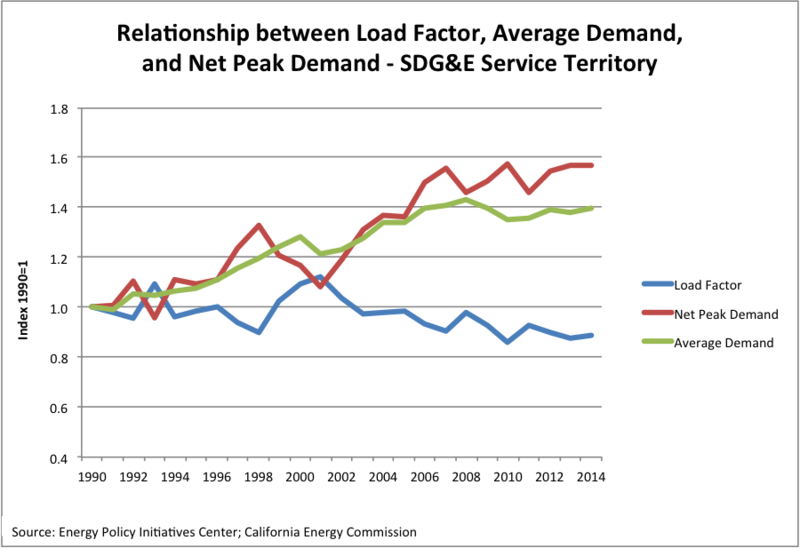 Figure 2 shows the relationship between load factor, average demand, and net peak demand for the SDG&E service territory. In periods when net peak demand declined faster than average demand load factor increased. This occurred in the early 1990s and then again in the late 1990s to early 2000s. Since about 2000 peak demand has risen more than average demand, therefore load factor has decreased. Can California IOUs do better than a 50% load factor? What is the optimal load factor? In Part II, we will discuss the factors that contribute to load factor and consider the effect of California’s aggressive greenhouse gas policies. This entry was posted in Energy, Greenhouse Gas and tagged Asset Utilization, California, Demand, Demand Reponse, Load, Load Factor, SDG&E, Time-of-Use. Bookmark the permalink. Two observations: First, the decline load factor may have to do more with declining loads overall than with the ratio of peak to average loads, particularly after 2006. California peak demand has been flat since 2006. To the extent that is this the case, it means that the falling load factor is an indicator of stranded assets rather than utilization factors. The solution becomes a financial one rather than an engineering or conservation one. Second, it appears that PG&E’s load factor is driven substantially by hydro conditions. The peaks, including the recent 3 year period, correlate with droughts, and the dips with wet years. Richard, I think you’re confusing load factors, which are computed based solely based on customer demand, with capacity factors, which are based on generating asset production.